Everyone enjoys driving with tube doors on so they get that outdoor driving feeling, so make sure the passengers in the back seat of your Wrangler Unlimited JL get to experience it also. 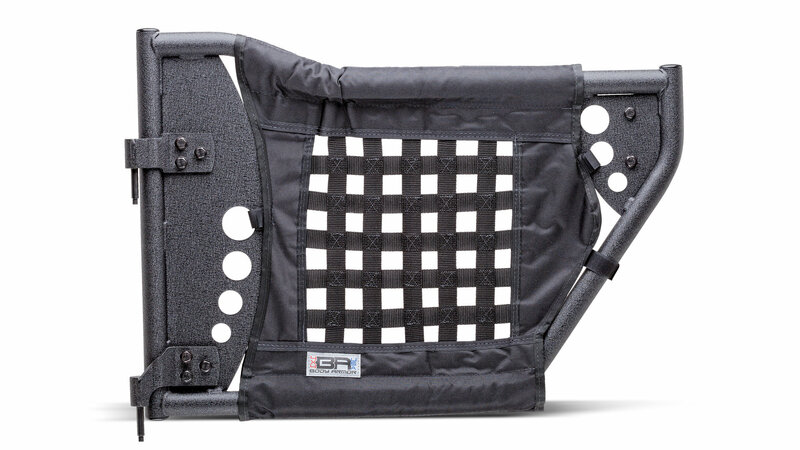 Do you and your friends a favor and get your Jeep a set of Gen III Rear Trail Doors from Body Armor so everyone can enjoy the open air feel while remaining safe while driving on the road or trails. These doors are constructed of steel tube and then finished with a textured black powder coat to protect from the usual dings and scrapes you my get while on the trails. Will not accept OE Mirrors. Security: The rugged steel tube construction will stand up to whatever is thrown at them while the exclusive hidden latch mechanism will keep these doors securely closed. Additional steel plate gussets are adding for a sharp look as well as added strength to your tube doors. Door Inserts: As a added bonus for protection from debris these doors come with woven nylon web inserts with padding for comfort. Easy Installation: Just take the doors off of your Wrangler JL and slide the trail doors onto the factory hinge with no modifications what so ever. You will be riding in no time with these tube doors on.